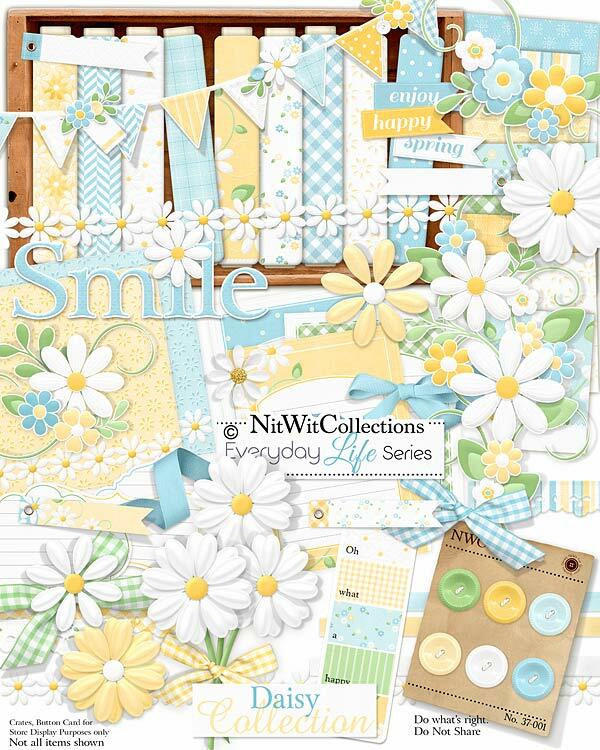 Everyday Life Series "Daisy" Collection is a burst of Spring! Bright and cheery blues and greens pair perfectly with the daisy flowers that are peeking their little heads out of the Nitwit Collections™ soil. Who isn't looking for a ray of light at this time of the year to create with. There are so many options to use this digital kit for.....is it a congrats layout or card for an expectant mom, is it a layout about a memorable garden or someone who loved to get their hands in the soil, is it to simply wish the best for someone or even a Mother's Day scrapbook layout or card (it's just around the corner, hint, hint!!). Whatever you see in your creative mind, this kit can fit the bill. Give Mother Nature a push and bring sunshine and light into your creations today! 3 Bows....don't they look like they belong on a picnic basket?? 3 Journal mats - in blue, yellow and green....which colour is your favourite to use?? 3 Ribbon bows - very celebratory ribbons with curly tails! 3 Satin ribbons in the colours of this kit....dress up your layouts and cards with them!